PDF it All is an advanced PDF converter that allows to convert PDF files out of many sources. Convert Word,Excel, PowerPoint, Web pages, Contacts, Messages, Mail to a PDF file in a matter of seconds. PDF it All features a smart and powerful to PDF Converter. Smart conversion of PowertPoint, Excel and Word files. Preserve the width and height of your document, while being flexible enough to convert images, web pages and many other sources. PDF it All creates industry standards PDF. You can open them in any other PDF application. 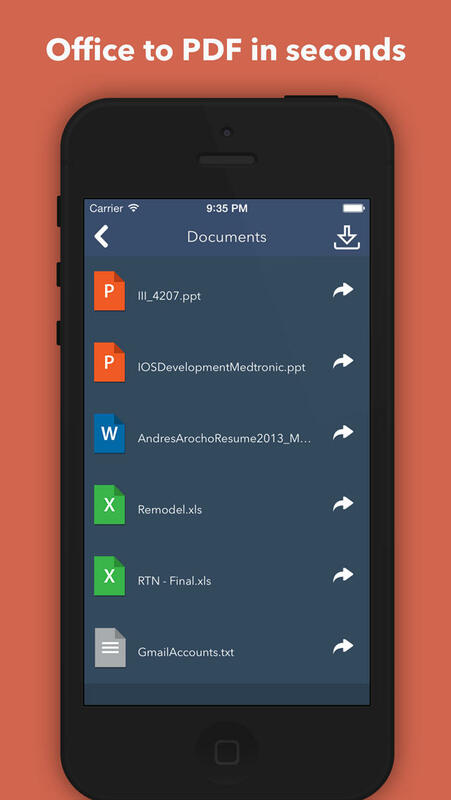 You can share your PDF via email, or use any other app you have installed on your device. Export to Dropbox, Evernote, Google Drive, Box, SkyDrive, etc.